Turtle shell rattles on the dancers legs. With our granddaughters visiting, we decided to attempt our first long outing since my surgery. It would involve six hours on the road on one of the hottest days of the year, and with the tour of the heritage center, would make for a very long day. 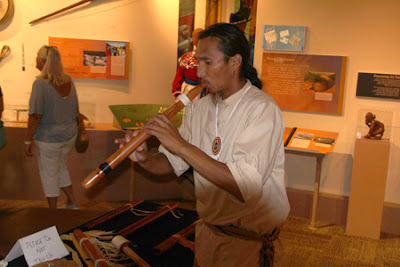 We were greeted in the main drive by a Chickasaw man speaking his native tongue, which he thankfully translated for us. He assured us we were just in time for the stomp dancing, one of the highlights I was looking forward to, and directed us to the Anoli’ Theater. With the mercury hitting 104-degrees, the dancing had been moved into the air-conditioned theater. Besides the dancing, we enjoyed an informative and very entertaining presentation on their tribal customs and traditions, and the common misunderstandings that whites have about Native Americans. 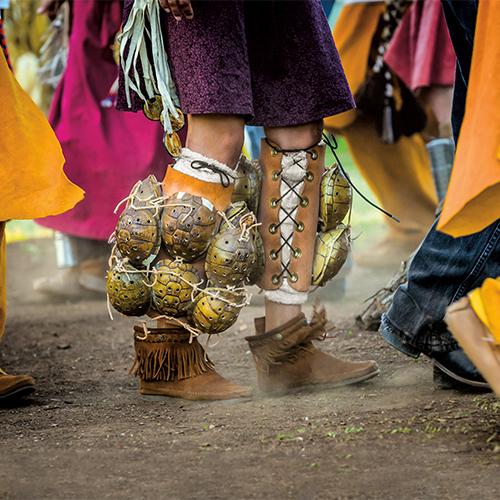 The stomp dances are accompanied by singing and the rhythmic rattles strapped to the dancers’ lower legs. The dancers follow each other in single line as they form a tight spiral, which then dissolves from within as they follow a wave pattern to morph into a second spiral, but then it also dissolves from within to return to its origin. The leg rattles were originally made from turtle shells filled with gravel. The commentator joked that they have discovered that when turtles become a little scarce, there are these metal cylinders available at Walmart that come in six-packs and twelve-packs, that work almost as well. steel tools and bolts of fabric. 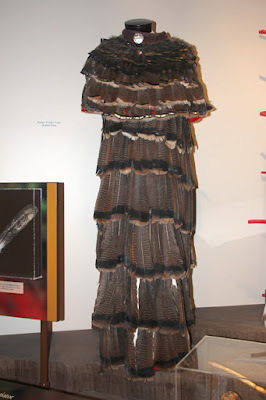 A beautiful ceremonial robe made entirely of wild turkey feathers. From the theater, we moved to the exhibit center to marvel at the many displays there. We began in a theater in a simulated council house for an introductory film. 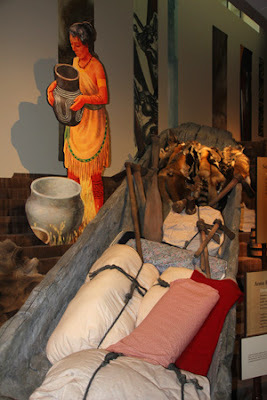 Displays included those highlighting tribal culture and lifestyle. There is the Spirit Forest, which emphasizes their close association and harmony with nature, the Exhibit Gallery, which features everything surrounding their lives from beadwork, tools and ceremonial implements, a ceremonial robe made entirely of wild turkey feathers, a dugout canoe which illustrates how the canoe would be loaded for a trading trip, and much more. The Removal Corridor tells the story of how Native Americans were impacted by the Indian Removal Act of 1830 by Pres. Andrew Jackson, their forced removal from their homelands, and the Trail of Tears. he had made, and some that had been given to him by his music instructors.